Paris at Noon is an homage to Woody Allen’s film Paris at Midnight. Even if you cannot live the magical Parisian adventures of his screen characters, you can still follow in their footsteps. 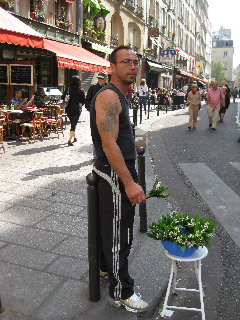 Today’s the first of May when Paris streets are filled with people of all ages offering sprigs of Lily of the Valley along with smiles and best wishes. The first time I saw this event, I thought ” La Fête du Muget! What a charming custom, and how commendable of the French to keep traditions alive.” I’d remembered reading how in 1561 Charles IX had been so delighted with a gift of Lily of the Valley, intended as a good luck charm, that he vowed to continue with a similar annual gift to the ladies in his court. Smitten with all this symbolism of spring, and good will, I gathered bunches of flowers from the extended hands until they formed a sizable bouquet and happily took it back to perfume our apartment. Later, commenting to a French friend on the unexpected generosity of passersby being pressed with flowers, he interrupted with a roaring laugh, “I’m SURE those people were more surprised than you – those aren’t gifts, those flowers are for SALE.” He explained that since 1948 the flower festival has been associated with La Fête du Travail, a public holiday celebrating worker’s rights. On this day only, anyone can sell Lily of the Valley sprigs without the need for license or paying sales tax. I was mortified and could see that vendors must have been too astonished to protest as I swept up their wares. At least there was no subsequent knock on the door from a policeman coming to arrest the Lily of the Valley thief; but I wasn’t taking any chances. The next year I tried to make amends by purchasing from every outstretched sprig-holding hand in the neighborhood. Now, we’ve moved to a different neighborhood and today, thankfully, there were different vendors who did not witness my earlier crime. However, I’m still trying to pay my debt. One vendor with an impressive display of tattoos, holding delicate bunches of flowers in vise-like hands, was especially happy for me to take his entire inventory. Shortly after we got back to the apartment, there was a knock on the door. But rather than the overdue gendarmes, there stood Martine, our all-caring concierge, smiling and holding out a fragrant bouquet of Lillies of the Valley.